Before FS-FlightControl can be used the main product database needs to be built based on your flight simulator data. This process is explained in this section. 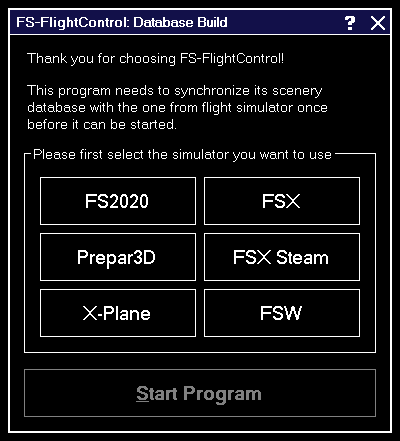 On the first program start this dialog will appear asking you which type of simulator you would like to use together with FS-FlightControl. In case you would like to use more than one simulator, no worries, you will be able to add more later on. If you use FS-FlightControl on the same computer where also Prepar3D, FSX oder FSW is installed both needed paths should be detected completely automatically and you just need to click on the button Build Database. But if you would like to use FS-FlightControl on a different computer connecting to flight simulator over network, then please use the SimConnect Network Wizard before starting FS-FlightControl. After the SimConnect Network Wizard has been completed and you did not skip the remote folder access tasks both paths needed for the database build should be detected automatically again. In rare cases where you should not be able to create a network share usable from your FS-FlightControl computer, you could also install FS-FlightControl on your flight simulator computer first just for database build, then copy the database to your FS-FlightControl computer manually. For this reason there is a small link in the dialog shown above that allows you to open the FS-FlightControl data directory. The file that needs to be copied after a successful build is the Database-[SimulatorName].bin. In case of the X-Plane simulator type only the main simulator installation directory is needed. Also here a local installation of X-Plane 10 or 11 is detected automatically. 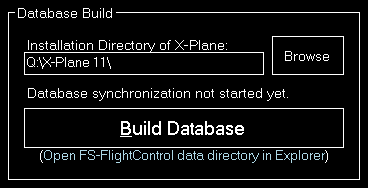 If you would like to use FS-FlightControl on another computer than the X-Plane one, just create a network share of the X-Plane directory to be accessed by FS-FlightControl for the database build remotely. 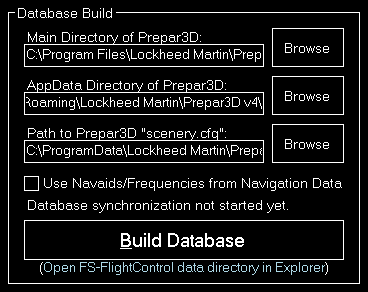 In case this does not work for some reasons, you could also install FS-FlightControl on your X-Plane computer first just for database build, then copy the database to your FS-FlightControl computer manually. For this reason there is a small link in the dialog shown above that allows you to open the FS-FlightControl data directory. The file that needs to be copied after a successful build is the Database-[SimulatorName].bin.